Saying goodbye and happy retirement to one of our longest-serving businesses at our Fieldhouse Industrial Estate in Rochdale. 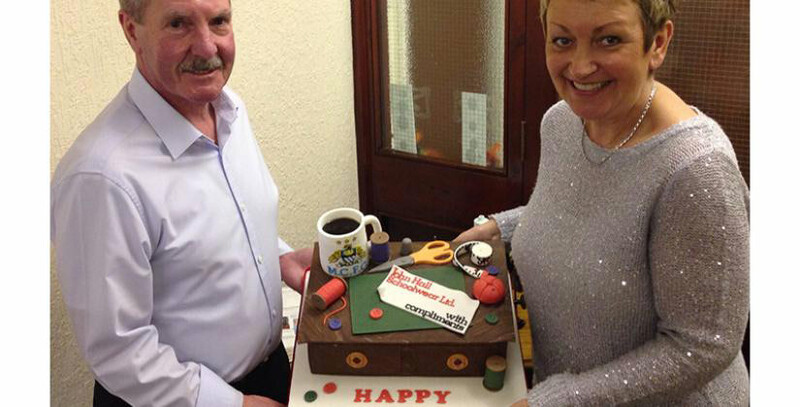 We would like to wish a very happy retirement to John and Maureen Hall, who founded one of the longest-serving businesses at our Fieldhouse Industrial Estate in Rochdale. For 34 years the couple ran John Hall Schoolwear, a specialist school uniform manufacturing business. As two of the best-known faces on the site, business centre manager Damien Maddock asked his wife, a baker, to create a special cake to wish them well for the future. The business first moved to Fieldhouse in 1979, as a convenient location to house the 12 machinists who previously worked from home. Company founder John recalls: “We started off in a small business unit for around 18 months, then as business increased we took a larger premises where we stayed for 28 years. John says it feels strange to not be working after 50 years, but he and Maureen, who ran the business alongside him, plan to spend more time socialising and seeing their four grandchildren. “I will miss seeing all the customers and the banter about football,” Manchester City fan John says. Fieldhouse was a wonderful place to work and our relationship with Damien and the team was fantastic. I also must praise the security company, who were always so diligent and caring. John Hall Schoolwear has been bought by Trutex and it will continue to operate from Fieldhouse Industrial Estate as an independent business within the group, from an expanded 20,000 sq ft premises. Fieldhouse Industrial Estate has more than 70 business units ranging from 600-53,000 square feet. For enquiries, please contact Damien Maddock on 01706 342 578.